Over the past forty years, numerous theoretical advances have been made. From Ayres’ and Braithwaite’s ground breaking work on ‘responsive regulation’, we have seen models of ‘smart regulation’, ‘regulatory governance’ and ‘regulatory capitalism’ emerge to capture the growing prevalence and importance of regulation in modern liberal Western capitalist societies. Important advances also have been made in the practice of regulation, with regulators evolving from traditional enforcement focussed ‘command and control’ models to being ‘modern regulators’ with a suite of diverse and innovative regulatory tools at their disposal. The book presents and critically examines these theoretical and practical developments from the perspective of governments who design regulations, and the regulators that deploy them. 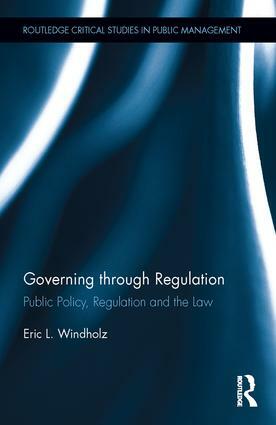 In doing so, the book examines the various forces and interests that influence and shape the regulatory endeavour, and the practical challenges facing governments and regulators when deciding whether and how to regulate. This volume is a study of regulation in context: in the context of the public policy it is designed to deliver; the law that enables, shapes and holds it to account; and the evolving societal and institutional frameworks within which it takes place. Aimed to provide innovative cross-disciplinary conceptual frameworks that regulators, regulatees, those whom regulation is intended to benefit, and academics, might employ to better understand and undertake the regulatory endeavour. This will be of great interest to researchers, educators, advanced students and practitioners working in the fields of political science, public management and administration, and public policy. Eric L. Windholz is a Senior Lecturer and Research Associate with the Monash Centre for Regulatory Studies., Monash University, Australia.